Career railwayman and Practice & Performance contributor John Heaton kept a detailed diary of the events – good and bad – during his role as a BR area manager, which is chronicled in book form. One memorable incident at Totnes is recalled here while maintaining an operational railway. I was responsible for 960 staff. MAS resignalling had to take place and the railway from Bridgwater/Castle Cary to Ivybridge, Castle Cary to Dorchester West, Sherborne to Exeter, as well as branch lines to Barnstaple, Paignton, Heathfield, Meldon and Exmouth had to be run safely and as efficiently as possible. I chose to live next to the infamous Dawlish Sea Wall section, and during my tenure, kept a detailed diary, recording both successes and failures, concentrating on operations – but inevitably chronicling the effect processes such as sectorisation had on getting the job done. The original notes are faithfully reproduced, with italicised passages if current comments are added in a book, ‘Devon Railways: The Area Manager’s Diary’ Volume 1 covering 1986-1987, which has proved popular. Volume 2 (1987-1988) will be published concurrent with this issue of The Railway Magazine. The books are available on Amazon (free P&P), with volume 1 costing £12.99 and volume 2 £13.99. A kindle version costs £4.99. The extract forms part of the entry for Sunday, October 18, 1987. The events constituted a failure in a great many ways, but were any successes salvaged from the mess? It is 11.00 and I am just deciding what to have for lunch before watching Spurs versus Arsenal on television when my operations assistant Bernard Price rings. time-served operator, who has worked the massive Shrewsbury signalboxes as a young man, and usually handles everything that crops up when he is on call. 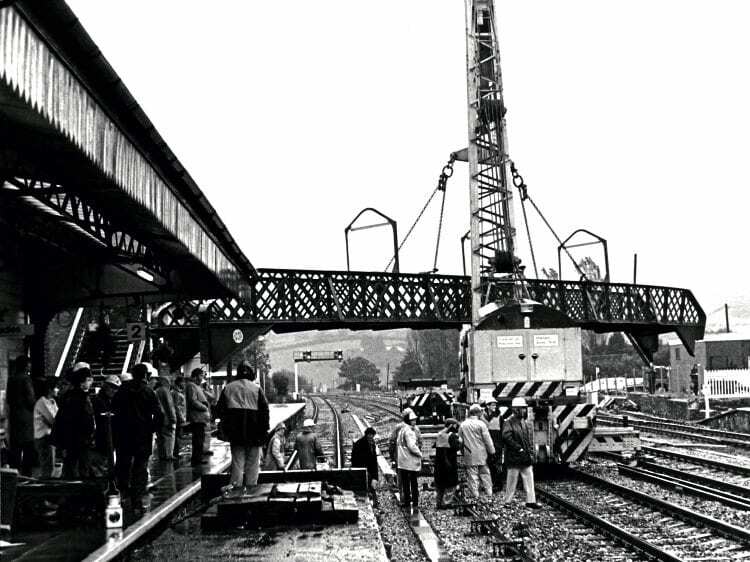 A rail-mounted mobile crane has been operating in the Totnes station area in broad daylight and has demolished the station footbridge by trying to pass under it with its jib raised. The problem is it was not hit hard enough to knock it out of the way and is too precarious to allow trains to pass under it. There is an estimate of 12 hours before normal working can be resumed, and buses are being organised by Exeter guards’ inspector Ray Thorn.